Fig. 1: Water wall from the Emerson House, Wakefield, Massachusetts, signed “R. Porter.” Photography by Martha and Bob Grimaldi. 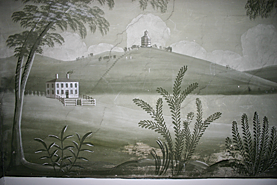 Many people still think only of Rufus Porter (1792–1884) when they discuss New England landscape murals of the 1825–1845 period. Current research poses the probability, however, that in fact muralist Jonathan D. Poor (1807–1845) was much more prolific than Porter, his more famous uncle and mentor. While approximately 115 to 120 murals have traditionally been attributed to or associated with Porter, there are only three actually documented with his signature—those in Wakefield (Fig. 1), Westwood, and Woburn, Massachusetts. 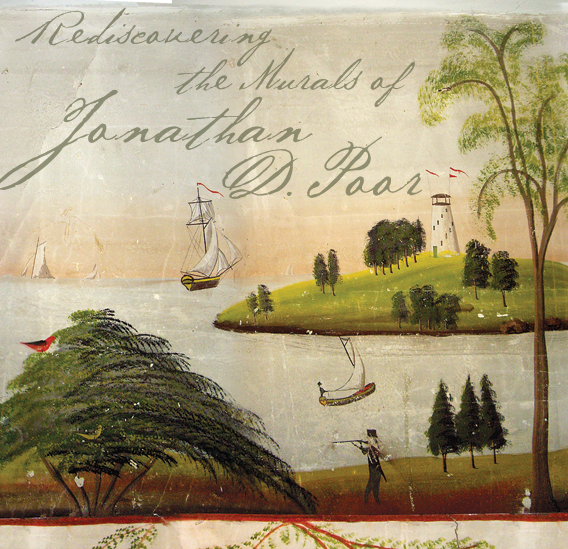 In contrast, while to date only thirty-five to forty murals have been attributed to Jonathan D. Poor, his signature appears in ten murals in Maine (Fig. 2) and two in Massachusetts, five of which are also dated, and some of which were previously attributed to Porter. This data and the reexamination of the known murals has allowed for the attribution of many other unsigned murals to his, rather than to Porter’s hand. Rufus Porter left his mark on nineteenth-century American history as an itinerant artist, muralist, inventor, teacher, and founder of Scientific American magazine, among others.1 Unfortunately, much less is known about his nephew. Fig. 2: Harbor scene wall signed “J. D. Poor.” James Norton House, East Baldwin, Me., 1840. Watercolor on dry plaster. Photography by Linda Carter Lefko. Fig. 3: Monochrome mural. Ingalls-Colby House, East Haverhill, Mass., ca. 1830–1840. Rufus Porter (1792–1884) is the only nineteenth-century New England muralist known to have painted in monochrome, as described in his Scientific American magazine articles of the 1840s. The monochrome walls, while not signed, all contain stylistic features known to be the work of Porter. Photography by Linda Carter Lefko. Fig. 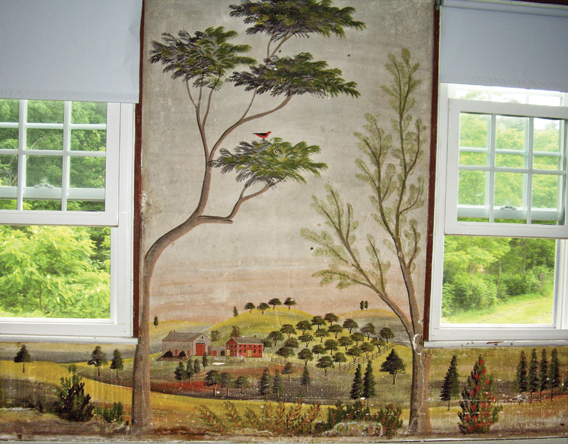 4: Muraled wall in the Dr. James Norton House, East Baldwin, Me., by Jonathan D. Poor (1807–1845), 1840. Watercolor on dry plaster. 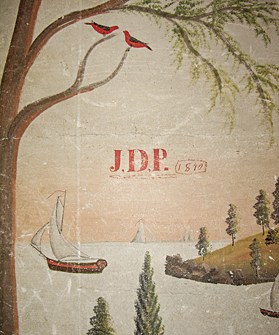 Another mural in this house is signed and dated “J.D.P. 1840.” Photograph courtesy the Rufus Porter Museum. 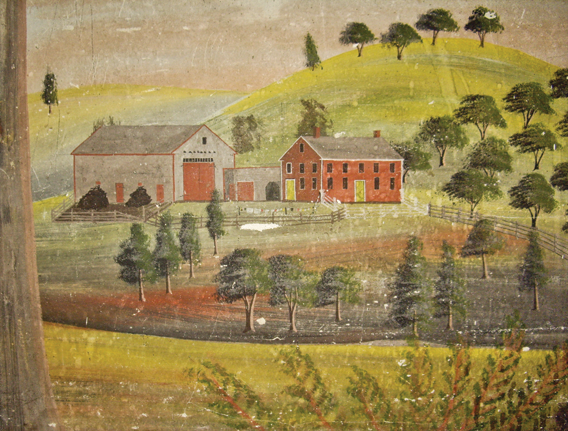 It has long been known that much of what appeared on New England muraled walls of the early to mid-nineteenth century was in keeping with Rufus Porter’s instructions on “Landscape Painting on Walls of Rooms,” first published in his Curious Arts (1825) and expanded in articles in the 1840s, first, in his New York Mechanic magazine and then in Scientific American.3 Porter published his instructions, along with other practical methods for producing a variety of artistic or practical products, soon after beginning his mural-painting career, and examples of his work indicate that he followed these instructions through the course of that career. His later expanded instructions, written after the death of Jonathan D. Poor in 1845, reflect further developments of style and technique, and incorporate elements of design from Poor’s work as well, confirming familiarity with Poor’s output. While murals by Rufus Porter and Jonathan D. Poor may appear, at first glance, to be very similar in subject and style, differences characterize the works of the two artists. Porter created murals with a large scale and minimalistic design, and rarely signed his work. He used bright, clear colors, usually with a limited palette. His subjects—trees (mostly elms), round clouds, fields, buildings, and harbor scenes—were bold in design and execution. He is the only muralist of the period who painted monochromatic scenes (Fig. 3). Poor’s work, on the other hand, is characterized by varieties of trees, orchards, farmhouses, a distinctive village building cluster, and birds (Fig. 4). Fig. 5: Signature and date of Jonathan D. Poor (1807–1845). Silas Burbank House, Mt. Vernon, Me.. 1830. Watercolor on dry plaster. The muraled walls in the Burbank house were removed in 1983. The entire wall is shown in figure 6. Photography by Christiana Cunningham-Adams. Fig. 6: Signature and date of Jonathan D. Poor (1807–1845). James Norton House, East Baldwin, Me., 1840. Watercolor on dry plaster. This mural is in the stairwell; others are in two upstairs bedrooms. Photography by Linda Carter Lefko. 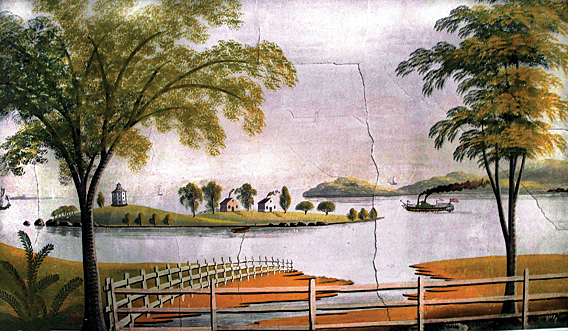 Between 1830 and 1842, Jonathan D. Poor signed and dated murals in five Maine houses. The first of these was the Silas Burbank House in Mt. Vernon, south of and contiguous to Vienna, where Poor painted a mural in one of the first floor rooms and signed and dated it (Fig. 5). 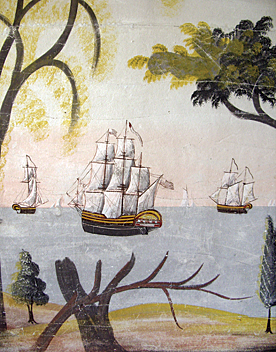 The wall with the signature depicts what would become a standard feature of a Poor mural, a harbor scene with island(s), often with a lighthouse or observatory, several sailing vessels of varying type and size, and often a man sailing a small skiff somewhere near the island (Fig. 7). 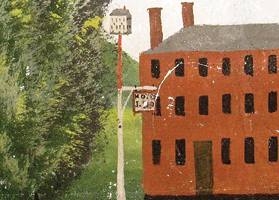 The second oldest-known signed and dated Poor mural was discovered in 2008 on a wall in the Jacob Johnson House in Vienna, Maine. The mural had been papered over for many years and was discovered during renovations to the room. Poor applied his signature—in the same block lettering as that from Mt. Vernon (fig. 5)—to a small portion of wall between two front windows, along with the date, which, though difficult to decipher, appears to be ”1832.” While much paint loss had occurred, it was possible to see that a harbor scene had been on one of the walls, along with several other characteristic Poor motifs, including scarlet tanagers perched high in tree branches. Fig. 7: Muraled wall by Jonathan D. Poor (1807–1845). Silas Burbank House, Mt. Vernon, Me., 1830. This harbor scene wall is now installed in the Van Gorden-Williams Library and Archives at the National Heritage Museum in Lexington, Mass. Photography by Christiana Cunningham-Adams. The most spectacular of the signed and dated Poor walls are in the James Norton House in East Baldwin, Maine, the area where Poor’s parents were living at the time the walls were decorated. The murals are in the central hallway of the small Cape Cod-style house, up the stairwell, in the small upper hallway, and in two upstairs bedrooms. The surprisingly large and bold-red initials and date, located in the sky section of a typical harbor scene containing sailing ships, an island, and a man in a sailing skiff, jump out at the viewer from the landing halfway up the staircase (Fig. 6). 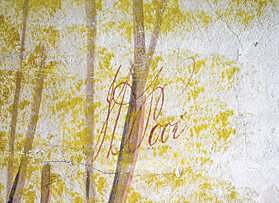 Although this is the largest and most prominent of the Poor signatures, it includes only his initials and date: his full name along with the date appear on the other four murals. 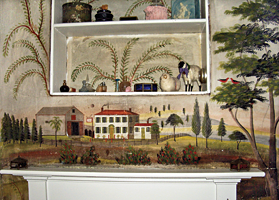 The elaborate murals in the master bedroom of the Norton House are a tour de force expression of Poor’s very detailed depiction of a farm and rural landscape, along with another harbor or inland water view. Above the room’s overmantel, the mural contains a signpost beside the white house that reads “HOTEL NORTON/1840,” a reference to the owner of the house and the year when the mural was painted (Fig. 8). The rose bushes by the front of this house are in full and colorful bloom, and there is great detail in the fencing in front of the house as well as in the window mullions and other minute features of the scene. 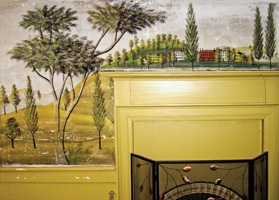 In contrast to the almost austere landscape in the 1830 Burbank House mural (see figure 7), these murals of ten years later are filled with scarlet tanagers and birds with yellow or gray bodies and black wings (fig. 8). Fig. 8: Overmantel mural by Jonathan D. Poor (1807–1845). James Norton House, East Baldwin, Me. 1840. Watercolor on dry plaster. Many of the motifs seen here appear in other Poor murals, both signed and unsigned. Photography by Linda Carter Lefko. Fig. 9: Overmantel mural by Jonathan D. Poor (1807–1845). Warren Pederson House, Standish, Me., ca. 1835–1840. Watercolor on dry plaster. The cluster of village buildings appears in many of Poor’s works. Photography by Linda Carter Lefko. Fig. 10: Signature of Jonathan D. Poor (1807–1845). Warren Pederson House, Standish, Me., ca. 1835–1840. Watercolor on dry plaster. Note the clever use of the sign in the overmantel village as the site for Poor’s initials. Photography by Linda Carter Lefko. Fig. 11: Signature of Jonathan D. Poor (1807–1845). Oliver Prescott (Priest) House, Groton, Mass., ca. 1835–1840. Watercolor on dry plaster. Here Poor has utilized the paddle box of the side-wheel steamboat for his signature. The paint has probably been “enhanced” to bring out the signature. Photography by Linda Carter Lefko. In the Warren Pederson House, Standish, Maine, Poor’s murals appear in a small bedroom and in what was originally the second-floor ballroom. One Poor motif that appears over and over again in both signed and attributed work is a cluster of buildings usually painted on an overmantel (Fig. 9). This motif, while sometimes arranged differently, always contains the same buildings, only varying in the amount of detail in the depiction (see also fig. 8). Poor used a signpost in front of one of the buildings to artfully provide a signature to his work — the sign reads: “HOTEL/ J.D.P” (Fig. 10). Fig. 12: Signature by Jonathan D. Poor (1807–1845). Judge Bean House, Readfield, Me., ca. 1835–1840. Watercolor on dry plaster. Faint initials are just visible on the ship’s stern in this harbor scene. Photography by Linda Carter Lefko. In murals of other houses, Poor utilized different conventions to cleverly let a perceptive viewer ascertain the name of the painter. Three of his signatures were written in pencil on vessel hulls. This may not have been a good idea, however, since at least two of these signatures or monograms have since faded almost to illegibility. 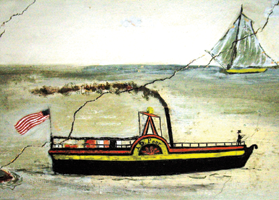 In Massachusetts, Poor put his initials on the stern of a sailing vessel in a house in Pepperell, while in the Prescott House in Groton, he added them to the paddlebox of a sidewheel steamboat (Fig. 11). In the Judge Bean House at Readfield, Maine, the initials on the stern of the ship can still be faintly seen if viewed under the correct lighting conditions (Fig. 12). Three houses in Parsonsfield and North Parsonsfield, Maine, display different types of Poor signatures, although none is dated. 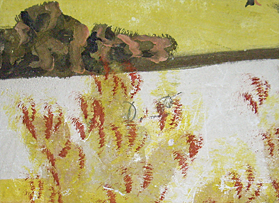 In the Dalton House, initials in script appear near a red-fruited sumac bush (another motif that appears in a number of Poor’s murals) on the shore in the foreground of the harbor scene in the lower hallway (Fig. 13). Two complete signatures are clearly visible, although in faint script, in the staircase and upper hallway of the Morison (Chellis) House, one in red and one in gray (Fig. 14). In contrast, stippled block letters are found under the branch of a fallen tree on the harbor scene wall in the lower hallway of the Dr. Moses Sweat House. Again, some of these are so faintly applied and so woven into the design that long-time owners were unaware of them until recently identified. Fig. 13: Signature of Jonathan D. Poor (1807–1845). Dalton House, Parsonsfield, Me., ca. 1830–1840. Watercolor on dry plaster. Small, subtle initials appear atop the red-fruited sumac bush. This is one of the instances in which long-time inhabitants of the house never noticed Poor’s initials. Photography by Linda Carter Lefko. Fig. 14: Signature of Jonathan D. Poor (1807–1845). Captain James Morison (Chellis) House, Parsonsfield, Me., ca. 1830–1840. Watercolor on dry plaster. This delicate script signature appears twice in this mural, once, in gray, part way up the staircase, and a second time, in red, in the upper hallway. Photography by Linda Carter Lefko. Fig. 15: Farm scene by Jonathan D. Poor (1807–1845). Dr. James Norton House, East Baldwin, Me., 1840. Watercolor on dry plaster. Note the details in the barnyard and the fencing, as well as the laundry drying on the clothesline. Photography by Linda Carter Lefko. Poor’s various methods of applying his signature to murals point to a practice common during the nineteenth century yet little discussed by scholars. It poses the question as to whether this was the result of a sliding scale of pay based on whether or not the homeowner allowed an artist to sign his works as a form of advertising. And was Poor, who seems to have had a dry sense of humor, at times hiding his signature, or making it inconspicuous, by incorporating it into his design when the home owner did not authorize it? Unfortunately, unless some contemporaneous documentation is located, the answers to these questions will probably never be known. But perhaps they will help historians and mural enthusiasts to look at the subject in a new light. Certainly it is hoped that Jonathan D. Poor will emerge as a principal personality in the field, and one deserving of greater acknowledgement and attention (Fig. 15). Postscript: The James Norton House in East Baldwin, Maine (see figs. 2, 4, 6, 8, 15), has been put on the market since the time this article was originally written. This fact, plus vibrations from recently re-activated railroad tracks seven feet away, put the murals in danger. Fortunately, the entire set of murals was donated to the Rufus Porter Museum in Bridgton, Maine, and they will be relocated to the museum’s forthcoming new location in downtown Bridgton. Here visitors will be able to compare and contrast Poor’s murals to the signed and dated Rufus Porter 1838 murals from the Dr. Francis Howe House in Westwood, Massachusetts, which are currently on loan to the museum. The Howe House murals were saved before that house was demolished in the 1960s. 1. 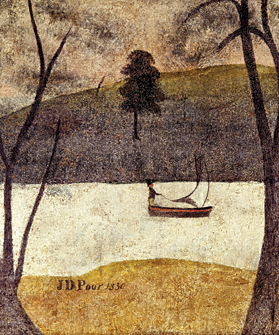 Jean Lipman, Rufus Porter Rediscovered: Artist, Inventor, Journalist, 1792–1884 (New York: Clarkson N. Potter, Inc., 1980). 2. Edith King, “Porter-Barton Notes, Copied by J.J. Haskell,” typescript, n.d., Maine State Library, give location. Also, personal correspondence between Janis Bruhn (descendant of Tyler Porter) and Jane E. Radcliffe, August 2009. 3. Rufus Porter, “Landscape Painting on Walls of Rooms,” in A Select Collection of Valuable and Curious Arts, and Interesting Experiments, Which are Well Explained, and Warranted Genuine, and May be Performed Easily, Safely, and at Little Expense (Concord, N.H.: J.B. Moore, Printer, 1825). New York Mechanic, 1841. Scientific American, 2, Nos. 39 – 49 (June 19–August 28, 1847). 4. Ben and Natalie S. Butler, “Serendipity and Franklin County Wall Paintings,” in Lewiston Evening Journal Magazine Section (May 1, 1971): 3A.